There is still much to be done to protect the hundreds of thousands of vulnerable children who have lost, or are at risk of losing, the care of their parents. Our support is crucial in this country, especially because of natural disasters which put families at great risk. Most recently, in early 2017, severe flooding left 1.1 million people in need of urgent assistance. Peru has, however, suffered from numerous natural disasters in the recent past. In 2007, Peru was hit by an earthquake measuring 7.9 on the Richter scale – this was considered one of the worst natural disasters in Peruvian history. In early 2017, torrential rains caused floods and landslides in many areas of the country, but these were particularly bad in the northern coastal areas. These natural disasters destroyed infrastructure and worsened the living conditions of many families. In addition to immediate assistance, the affected families needed long-term support to rebuild their lives. Social and economic inequality remains high. In a multi-ethnic country like Peru, aspects like racial heritage, skin colour and social background often have a great impact on a child's future. Peru's indigenous population is still largely excluded from wealth and political power, a major reason why so many of them live in poverty. Over the last years, Peru has seen steady economic growth. In fact, the Peruvian economy has recently been one of the fastest growing in South America. However, many Peruvians have not benefited from their country's progress. Around six million people live in poverty, mostly in rural areas. 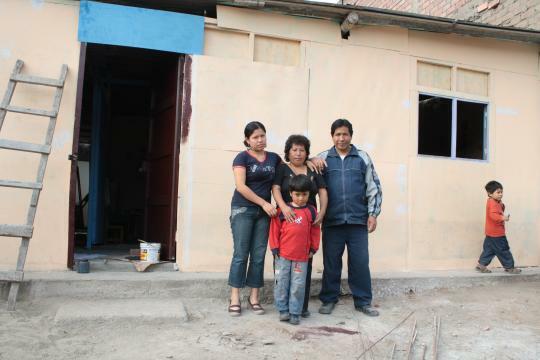 After the 2017 floods, the Peruvian authorities feared that, unless families were supported, an additional 700,000 people could end up living in poverty. The 2017 floods also affected around 800 health centres at a time when the number of diseases, caused by the lack of clean drinking water and sanitation facilities, was rising. In addition, there was an increase in the mosquitoes that transmitted the Dengue and Zika viruses. 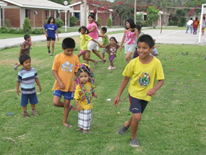 Over the past few years, the situation of the children in Peru has noticeably improved. For example, child mortality and under-five-mortality rates have dropped drastically. However, children continue to face many difficulties. The child labour rate in Peru remains high at around 34 per cent. These children have often dropped out of school, either temporarily or permanently. Although the number of children starting primary school is very high, about one quarter of children do not go on to secondary school. SOS Children’s Villages started working in Peru in 1975. Strengthen families: SOS Children's Villages works with local organisations and communities to support vulnerable families so that they can stay together. We ensure that they have access to basic goods and services such as health care and education. We also provide training and advice so that parents can generate an income to look after their children. In 2016, around 4,230 families were supported through the family strengthening programme. Care in SOS families: If, in spite of all support, children are unable to stay with their parents, they can find a new home in an SOS family. Children grow up with their brothers and sisters in a safe environment. Some families live integrated in the community. Wherever possible, we work closely with the children’s family of origin, so that the children can return to live with them. Support for young people: We support young people until they are able to live independently. We give them access to further education and vocational training – for example in the English language and computer skills - so that they have the right skills to find a job, or start their own business. We also partner with local business so that young people can gain practical work experience. Emergency programme: In response to the 2017 floods, SOS Children’s Villages provided immediate assistance which included shelter, food, drinking water, first aid supplies and baby kits. The families in need were then given long-term support through the family strengthening programme. Advocacy: We work closely with state departments, local communities and organisations to improve the rights of children, in particular those who have lost, or are at risk of losing, parental care.